The historic flood of merger and acquisition agreements that swept through the semiconductor industry in the past two years slowed to a trickle in the first half of 2017, with the combined value of about a dozen transactions announced in 1H17 reaching just $1.4 billion. In the first halves of 2016 and the record-high M&A year of 2015, the combined value of acquisition agreements in 1H16 and 1H15 totaled $4.6 billion and $72.6 billion, respectively (Figure 1). Last year, M&A got off to a slow start—compared to the record-breaking pace in 1H15—but several large transactions announced in 3Q16 pushed the 2016 total value in semiconductor acquisitions to nearly $100 billion and within striking distance of the all-time high of $107.3 billion set in 2015. A few major semiconductor acquisitions were pending or rumored to be in the works during July 2017, but it is unlikely that a 2H17surge in purchase agreements will bring this year’s M&A total value anywhere close to those of 2016 and 2015. 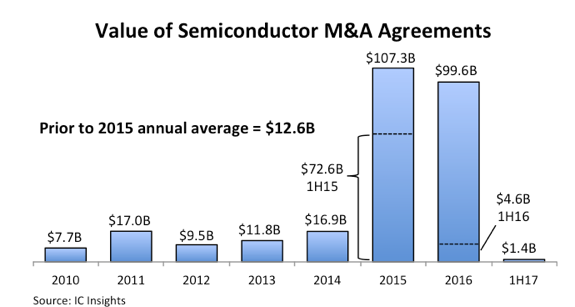 The big difference between semiconductor M&A activity in 2017 and the prior two years has been the lack of megadeals. Thus far, only one transaction in 2017 has topped a half billion dollars (MaxLinear’s $687 million cash acquisition of analog and mixed-signal IC supplier Exar announced in March 2017 and completed in May). There were seven announced acquisitions with values of more than $1 billion in 2016 (three of which were over $10 billion) and 10 in 2015 (four of which were over $10 billion). IC Insights’ M&A list only covers semiconductor suppliers and excludes acquisitions of software and systems businesses by IC companies (e.g., Intel’s planned $15.3 billion purchase of Mobileye, an Israeli-based provider of digital imaging technology for autonomous vehicles, announced in March 2017).